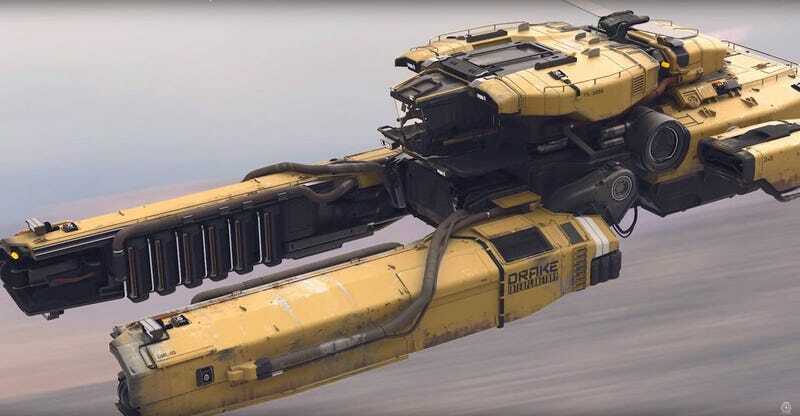 Fans of the still-in-development space game Star Citizen have been able to piece together scattered images of a brand new ship design from social media clues. This first look at the newly designed salvaging and utility ship, the Vulture, has many of them very excited — and many EVE Online players a bit perturbed. The Vulture’s design has been slowly released via social media over the last few weeks, allowing players to puzzle together what seems to be the final look of the new vessel. 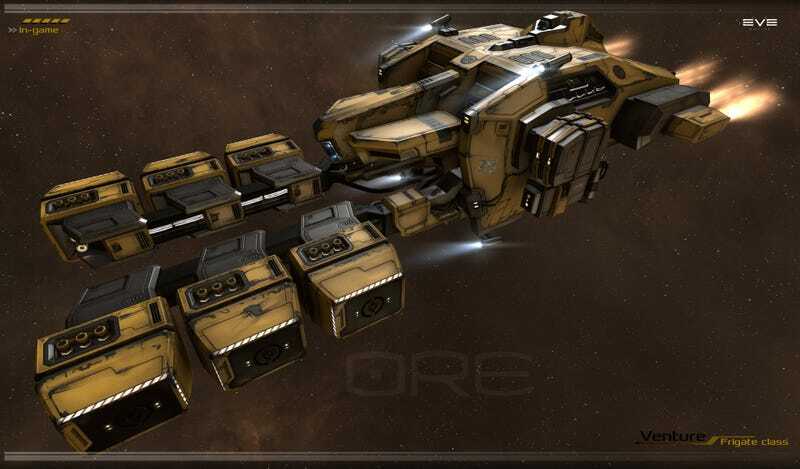 Once the images all came together, EVE players noticed a very familiar design, immediately claiming that Star Citizen’s developers have copied the design from a small EVE mining ship, the Venture. There is no denying that the two ships are similar in construction, but is that alone enough to call foul? Both ships are small industrial ships, utility vessels built to perform dirty jobs for long hours. Both ships are meant to be relatively cheap entry level vessels, serving similar but not identical purposes in their respective universes. Even Star Wars features a ship that has a very similar layout. Whether intentional or not, the reveal of the Vulture has caused several bitter feuds to start up between fans of the two games on Reddit and other social networking sites. Several EVE online personalities, from streamers all the way to EVE Online community developers have taken to Twitter, sharing memes and light hearted jabs at Star Citizen. One of the EVE Online developers tried to calm things down, saying that disputes between the player base should be handled in the virtual world, offering Star Citizen players the opportunity to sign up for EVE. 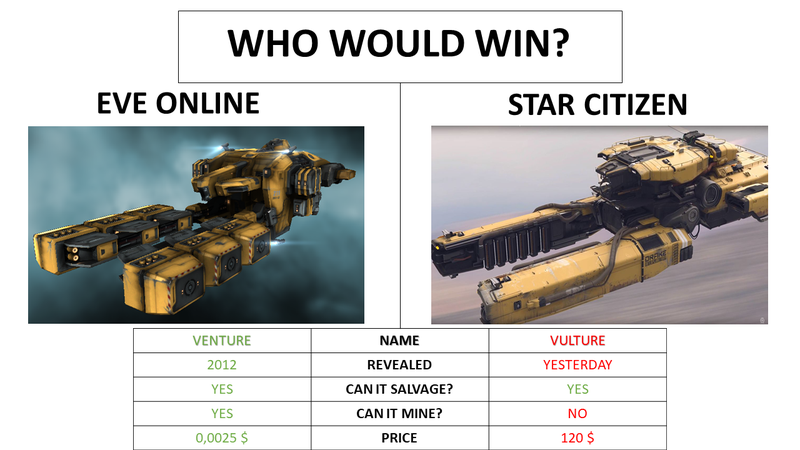 Reddit user RealHorstOstus provides a light hearted comparison of the two vessels. Some of the jabs between the two communities have not been in good fun, however. A post on the r/EVE subreddit shows that moderators of both subreddits are even beginning to get embattled in the fued. In the image, one of the moderators for the Star Citizen subreddit claims that the r/EVE moderators are allowing their member base to engage in ‘vote-brigading’. In Reddit lingo, this means sharing links with the instructions to go and up- or down-vote to force an agenda or opinion. One EVE Online player even seemed to confirm that the EVE subreddit had been collectively reported to the Reddit admin team for this act, which is against the site’s rules. EVE Online and Star Citizen both are known for having fanatical fan bases and more than a little bit of a rivalry, so clashes like these are not entirely unexpected. At heart the games are similar in scope and attract very similar types of players, hopefully this will all blow over soon and the two communities can kiss and make up.